Sampling conducted in such structures has not confirmed the occurrence of high values in the area, although it should be considered that the distribution of Au within the veins of the district is timely; any result can be affected positively or negatively by the nugget effect. The Catfish is located 28 miles NE of The Catfish municipality, Antioquia department, including the village of Tupe (Figure 1) and the sector Pisingos. The Sandy pathway on the eastern flank of the Central Cordillera. Access from the town of Catfish can be done by aerial means arriving at the airport Tomin, and the area of interest is reached by a river trip (50 min) and mule (1.5 hours) on mules. Traditionally there has been a strong alluvial mining activity related to the Cauca, and Tigui Nechí rivers and mining this vein being much less developed. Londoño et al (2009) identified in the mining district several vein systems, separating them into two sectors: one near Nechí north and a southern area near the Catfish and Zaragoza. Veta La Ye. With address 340/52 SW and average thickness of 1 m, has areas of thinning. It is embedded in a composition tonalitic intrusive cut by a series of acidic medium grain dams aphanitic andesite latter stationed where post-mineralization failure. Veta El Carmen: available with 5/45 SE with an average thickness of 1.2 m, embedded in a granite body called Stock del Carmen, composed mainly of quartz, feldspar and biotite altered to chlorite. Geominas SA reported the existence of two mineralized zones present in the Segovia Batholith with apparent structural control. 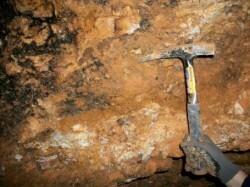 The first related to the metamorphic foliation litodema located towards the center of the mining title, N55E/40SE general structural arrangement consisting of quartz veins with free gold prospect to the La Sandy. The second zone of mineralization has a general provision heading N45W with variation in dip direction between 25NE-50SW, mainly associated with siliceous dikes considerable power with the presence of free gold. It has identified at least 4 quartz veins with sulphide mineralization (pyrite and galena) whose arrangement varies direction (Figure 10) and dip. Of these veins have two N70W direction, one direction N39E and N70E direction.